This is a gorgeous cover, my favorite of Mr. Wright’s along with “The Book of Feasts and Seasons”. This image should look a little better than the previous one used. Yes, this is Mr. Wright’s new book. 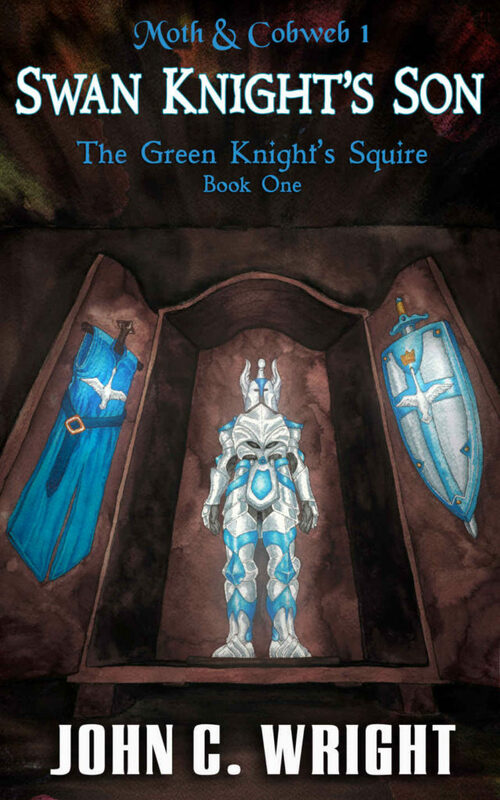 Full disclosure: thanks to Mr. Wright’s generosity I was allowed to read the original, unedited version of the full “Green Knight’s Squire” saga (of which “Swan Knight’s Son” is the first volume). As such, some of the review is colored by things from the original version of the book that didn’t make it into this one. First, let me just bring up the characters. This novel has, easily, my favorite cast of John C. Wright characters. Gil in particular is far and away my favorite protagonist from any of his books or stories (Flint from “Pale Realms of Shade”, itself set in the same universe, is number two for VERY different reasons). Gil acts like I’ve always secretly wanted to act; who doesn’t wish they could go around talking like a medieval knight and beating up people who deserve it? He’s also probably the best and most entertaining role model for young men I’ve ever read. In many interesting ways he’s almost the opposite of Ilya in “Somewhither” (who is far and awayy my LEAST favorite protagonist in a John C. Wright novel). I also think Ygraine, Gil’s mother, is probably his most interesting female character, with the possible exception of Antigone from “The Cry of the Night Hound” (though, technically, the latter was originally used in a story a bit older than Mr. Wright’s). Ruff, Gil’s talking dog, is funny and endearing, though I will say at risk of revealing a very minor spoiler that I believe he becomes more interesting later in the saga. After reading the original, unedited version, my biggest criticism (which is very minor) is that I do think some of the cuts make things a little less clear than they properly should be. For example, at the end of the novel, I feel as if we’re missing a chunk of exposition between the final two scenes of the book (it’s hard to be more specific without spoilers) – and indeed, we are. It doesn’t make the book incomprehensible or even particularly confusing, but to my eye it seems slightly rushed. Similarly, at the beginning of the novel – and as it’s a part of the basic premise I’ll mention it without worrying about spoilers – due to a fight at school Gil is expelled. In the original version we are told the circumstances of the fight, and the events that lead to Gil’s expulsion, in great detail. In this first version of the story, it is very clear that Gil’s expulsion was completely unjust and that he was not responsible for the circumstances that lead to the fight. In the new version, the exact events leading up to the fight are glossed over, and it seems much less clear (to me, at least) that Gil’s expulsion was almost entirely not his fault. That’s not to say, mind, that I think it was a bad decision to shorten that section – but perhaps it could have been shortened a little less. I also found it unusually short, but then, it is a young adult novel. My complaints are just about the pickiest of nitpicks you’ll ever see. I haven’t noticed anybody else even mention them, which indicates that they might just exist because I know the text of the unedited version – if you don’t, you won’t even notice them. I absolutely loved the book. The characters are wonderful, the plot is charming but with a hint of darkness at the edges, and the worldbuilding is brilliant. Perhaps it isn’t fair or technically correct to say it just about volume one, as it’s really only the first part of a full novel, but I’ll say it anyway: This is the best novel that Mr. Wright has ever written, young adult or not. If you’re a fan of any type of classic young adult fantasy, from the Narnia books to “A Wrinkle in Time” (which isn’t really a fantasy but often reads like one), you owe it to yourself to get this book. I give it the highest recommendation I can.